Reinvigorating Downtown Boston with a new level of luxury residential condominium offerings, dynamic street-level retail and innovative office space. The much anticipated Millennium Tower celebrated its groundbreaking ceremony on September 17, 2013. The $630 million project consists of the landmark 1912 Burnham Building and a dramatic, new, mixed-use tower in the heart of Downtown Crossing that will rise 685 feet into the Boston skyline. Construction is underway with completion slated for 2015. Millennium Tower will consist of 450 luxury residences, ranging from 1 to 4-bedroom floor plans, and 95,000 square feet of additional retail space on its lower floors. 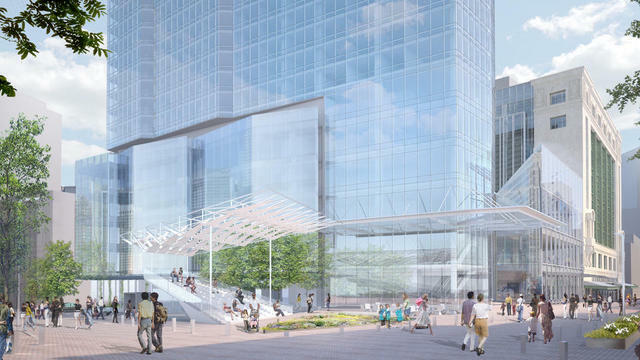 Along with the additional retail space in the adjacent Burnham Building, the site will be home to a Roche Brothers Supermarket.The 56-story glass tower will also include an underground parking garage.